Class Format: On-demand teleclass to take anytime, at your convenience. You will receive links to 5 hours of MP3 recordings (from a live class which includes the questions, comments and interactions of the participants with the instructor) and PDF’s containing 74 pages of detailed handouts. These books are required to heighten students’ awareness of diverse spiritual beliefs about pet loss that may likely be encountered with clients. There is no assumption or expectation that students hold, or should hold, any of the beliefs represented in either book. Who Should Attend: Any helping professional who works with clients who experience loss or trauma. Particularly helpful for counselors, therapists, animal communicators, veterinary professionals and other animal care professionals who want to consciously use the issues surrounding spirituality effectively, ethically and with sensitivity. Sometimes, a major loss, trauma or crisis can challenge the very heart of our spiritual beliefs, rocking the foundation of what we have held most meaningful and perceived as truth. As helping professionals, the way we help our clients deal with such crises of faith, and all issues of spirituality, can either enhance or impede their healing process. The role of spirituality in pet loss grief counseling must be handled with care. Do you know what the “spiritual bypass” is? Is there any chance you have inadvertently used this with clients and negatively impacted their healing? Have you ever worked with a client who is in distress or great inner turmoil because of the conflict between what their priest/rabbi/spiritual teacher is telling them about animal souls and the afterlife and what they believe in their own heart? Have you ever been concerned or confused about the gray area between sharing a spiritual concept that you believe will truly help a client but wanting to do it in a way that is not preachy or imposing, wanting to handle the issue of spirituality in pet loss grief counseling well but feeling unsure how to do so? Have you ever been confronted with a client experiencing a crisis of faith—their beliefs shattered by a major trauma or loss and are now unsure what to say? Have you ever wondered about the best way to handle it when a client’s spiritual beliefs seem to clearly be preventing them from healing or finding peace? Have you ever been taken aback by a client’s description of their religious or spiritual beliefs, rituals or practices? Perhaps because they may be polar opposite to your own beliefs, you’ve never heard of such beliefs or you worry that these beliefs may be an obstacle to their healing? 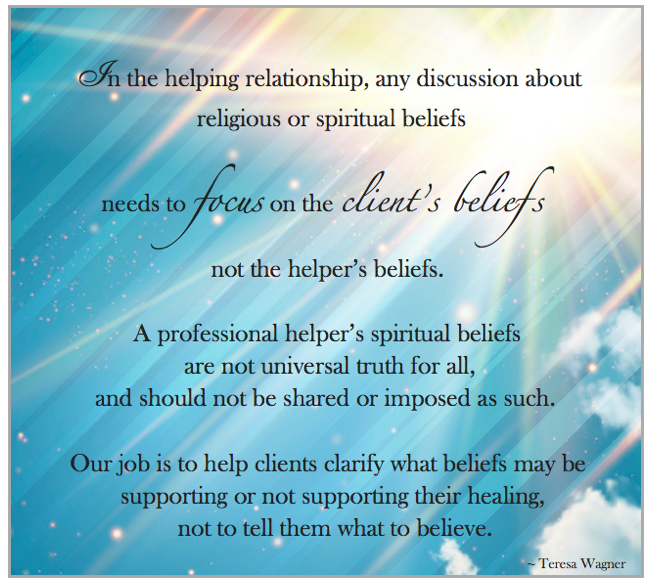 Have you ever worked with a helper/healer who preached (even softly and kindly) to you regarding spiritual beliefs–expressing their beliefs as if they are the “truth” for everyone, encouraging you to take on these beliefs? Have you ever given much thought to the issue of spirituality in pet loss grief counseling? These issues and many others are discussed and reviewed in-depth in this class. Whether your professional roles include veterinary medicine, animal communication, energy healing, counseling and therapy or any healing arts or other helping roles, the information, exercises and resources in this class are designed to help you feel more comfortable, confident and effective in integrating the issues of spirituality in pet loss grief counseling and any helping relationship. our emotionally broken hearts. . .
because if we just believe the right thing spiritually, we won’t have any grief. 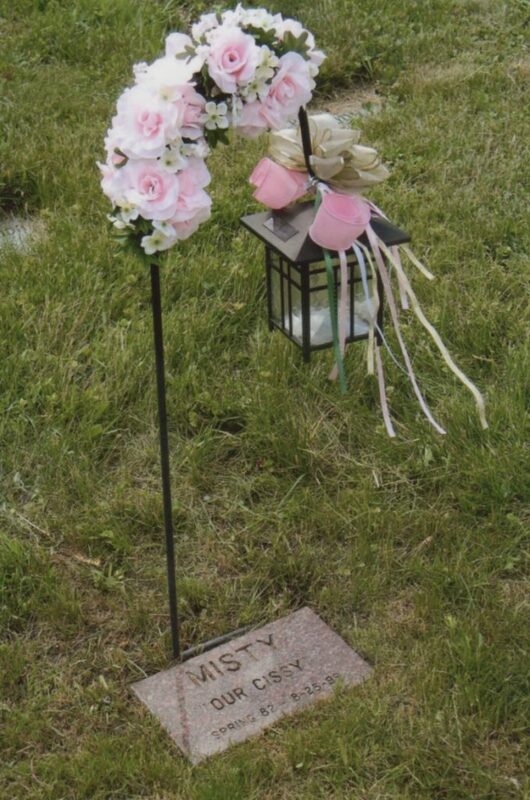 in pet loss grief counseling. Why a class on the role spirituality in pet loss grief counseling? The role of the helper regarding spirituality in client relationships: empowerment or preaching? This class is filled with a wealth of resources. The materials, exercises and discussion invite the participant to reflect, shift and grow, thus deepening their skills when helping people. I like all the re-wordings offered. Those, along with having case scenarios & exercises, helped me think and reflect on what to say or not say in a situation, both so helpful. Doing the exercises really made me think about my position, feelings and beliefs. Some were easy and some were difficult to look at. I am grateful for that because it helped me see my own filters better. Sometimes I think I have accepted some things as truth just because they sounded good—so no real in depth consideration was given—so I really enjoyed taking the time to do the exercises. As always, Teresa’s manner is thoughtful and considerate. She shares the information gracefully, and invites input and discussion from the audience. I always feel welcome to share my feelings. Teresa is skillful at addressing the comments and discussion on any questions that come up during the course. Fascinating class that explores such important topics related to spirituality and the helping professions! I learned a lot about myself and about how to better support my clients. I feel like this course should be offered in colleges for any social work/psychology programs. It’s such important information. The section about anger/hate/forgiveness was so valuable on both a personal and professional level. These are issues that everyone can benefit from exploring! Teresa is always insightful, respectful and knowledgeable! Many things applied to me that I hadn’t fully understood before; such as thinking if I’m spiritually okay with grief, I shouldn’t feel emotional pain. Not true. And reminded me to talk less, listen more. Good counseling is “ask, don’t tell.” This was stressed over and over, and for very good reason. The exercises of putting pen to paper makes us go deeper into the exercise and experience, rather than just thinking about it. A well organized class. Teresa is compassionate, human, and wise, a great combination. Well organized and good reading lists. Thank you. The class was very informative. The exercises and examples were excellent. The topic has potential to be very boring, but it was not boring at all. Teresa is a high caliber teacher with much to offer those working in the fields of grief support/counseling/therapy and metaphysical fields. Teresa skillfully simplifies concepts which could potentially be overwhelming and provided excellent examples that keep things interesting and fun. My most significant learning from this class is how powerful and hurtful certain words can be. No matter what class I take with Teresa, I not only learn skills and perspectives to help the client, but I always learn a lot about myself as well. Despite my previous mental health clinician education, I had never been in a class like this, one that delved into the role of spirituality, in all its forms and diversities, and its role in the helping relationship. Learning how to navigate this difficult subject in a loss and grief session, is really invaluable, and can build trust, helping the client to a deeper self-discovery. And no one is better equipped to teach this than Teresa Wagner, a teacher of great vision. All of Teresa’s classes are really in-depth, and to me, are on a graduate studies level, yet with her unique way of presenting the material, it is always an enjoyable, lively adventure. And being able to discuss back and forth with the other attendees adds an extra dimension for me, getting all of their very interesting perspectives as well. I am looking forward to the next class! I always knew that the whole spirituality / religion thing was a touchy issue. And I try to navigate the conversation in the helping relationship as best as I can, but I have really learned to fine-tune this process, thru this class. I learned that there are subtle comments I sometimes make to bereaved people, however innocently, ( ” he is in a better place,” etc. ) that might be offensive or dis-empowering to a person, be it within the counseling context or just talking socially to acquaintances. I learned in this class that we all have ‘filters’, ( our own personal belief systems ) that we, sometimes with thinking, impose on others, thru a single well-meaning comment, regarding loss and grief, that could be discordant to another person. This class about spirituality in pet loss grief counseling was really eye-opening for me.It gave me solid, useful, step-by-step instruction as to how to approach this issue with the client. I learned further how to develop a safe place for the client to explore what is really meaningful to them, in terms of their own spirituality, helping them find what is important, what is grounding to them. All the while, maintaining an atmosphere of great respect for them, in a non-judgmental context. We were given ideas on how to pose questions, what statements to open with, that can really be very helpful, non-threatening, and encourage dialogue and healing for the client. Learning about those subtle ‘filters’ we all have and how to turn them off while in a session….also the step by step instructions on appropriate questions, phrases, that Teresa modeled for us, that will encourage discussion rather than accidentally shutting things down. And the movie clips were useful to me, too, where I very quickly learned things about my own feelings about loss, death and spirituality and the rituals, etc. that would be important to me. There were extremely in depth handouts…in fact, calling them ‘hand-outs’ is really giving them short shrift ! The 75+ pages of fascinating, well-presented, graduate-level instruction could have been a text-book in itself, not to mention the great resources and book lists in the back pages. A stellar experience ! By watching the clips, doing the exercises, I really learned a lot about myself regarding my own spirituality and what rituals are important to me. And the case studies and modeling were very helpful in visualizing what to do and what not to do, in a helping relationship, in this spirituality context. Reading about this is very helping, but seeing it ‘in action” in a modeling situation or case study is very powerful. I am so glad to have met Teresa! I have visited her website for 15 years and always saw her as one of the few people I have ever encountered who loves animals as much as I do. And her concern, love and respect for all creatures is so apparent in her website, even to people who don’t know her. When the time was right, recently, I took the plunge and joined in her class experience and its been really amazing. Her love and respect for all mankind, animals and people, is so apparent and I can’t think of anyone else that I would want to learn from at this point in my life. People can take ‘classes’ in any university, as I have done, but I don’t think they are going to have the fascinating experience they will have taking a class from Teresa. 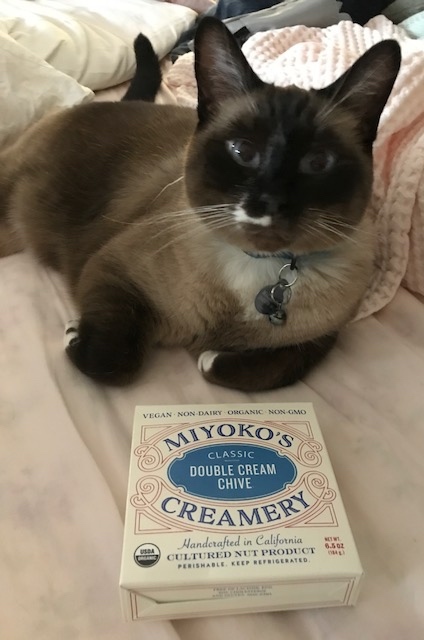 Her particular grasp of spirituality, understanding of psychology, love of animals and vast experience in the field of animal communications, makes her uniquely qualified to offer classes that, in my estimation, can’t be found any where else. Respecting a person’s spiritual journey is much more than tolerance. clarity and learn the client’s worldview. the person find their own.